The main aim of One Teacher School Project (OTS)is to take education to the doorstep of every household. The Gram Samiti of a particular village ensures co-operation between OTS and the enthusiastic villagers. The Acharya or Teacher is responsible for running the school. They make sure that the students of OTS are aware of the greater world outside. One of the first steps towards the greater good of education under the initiative of Gyan Jyoti was to support Friends of Tribals Society for their One Teacher School Project. Along with One Teacher School Project, we have lended our support to schools in Pukuria, Paschim Perghumti, Dakshin Parghumti, Dakshin Patghara and Malakanghumti district. It also feels great to see that we are being able to impact the lives of the children in a positive way which is best reflected through the latest progress report of the 5 Ekal Vidyalayas sponsored by our organization. According to a recent survey, about 17.7 million children in India are out of school and lead a poverty-stricken life.Hence, Gyan Jyoti spread out their helping hand to bring the much awaited changes in the rural society.This was a small initiative on our part in order to make the everyday struggles of the less privileged section of the society easier.We believe in lighting up lives by spreading education. 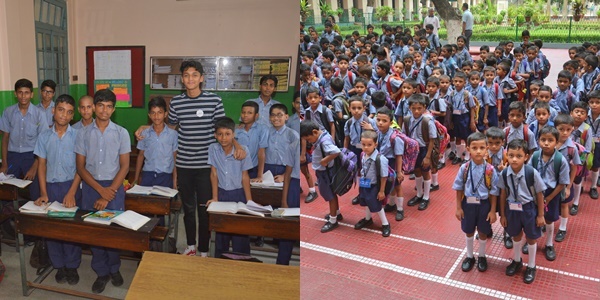 Working towards the enhancement of this society, Gyan Jyoti organized its Hare School Project to promote literacy among the lesser privileged section of the society. Even so many years after independence, there are many students who cannot afford to buy a book. Mrs Rakhi Basu distributed books, school bags and exercise copies to the students of the school to encourage literacy. She also interacted with the students, parents and the teachers. Every child must have the right to basic education and every child must have text books. Books are the foundation of a strong educational system. The main aim was to provide stationeries and books to those in need of it. It was to ensure that no child remains uneducated because they cannot afford to buy books and copies. We received a warm welcome and a lot of support from the school authority,the principal and the students that helped us enormously to carry our campaign successfully. Gyan Jyoti feels immense pleasure after hosting the event on 10th November 2017 to encourage literacy among the less privileged children of the society. We distributed school satchels and school uniforms to students of Sulanguri Colony Para FP School. Students, teachers, head teacher, the principal of the school, members of our organization and our honourable trustee Mrs. Rakhi Basu were present at the occasion. The event started with a welcome speech by Mrs. Basu. The names of the students in accordance with their respective classes were called and school satchels ,school uniforms and food packets were handed to them. The students were patiently waiting for their turn to come and their eyes were gleaming with excitement. As soon as their names were called, they ran towards the stage to receive their gifts with their heart touching smile. Their faces lit up with joy after getting their new school uniforms and school bags. We also had a conversation with the principal, the head teacher and the teachers of the school about the various problems that the less privileged section are facing regarding education. The teachers said that the children who come from the lower strata of the society face several family issues, hence they suffer from mental trauma. The innocence of these children is often destroyed because they have to fight with the harsh realities of life everyday. In the words of the head teacher, these children aren’t like normal children, they are more aggressive and stubborn in nature. 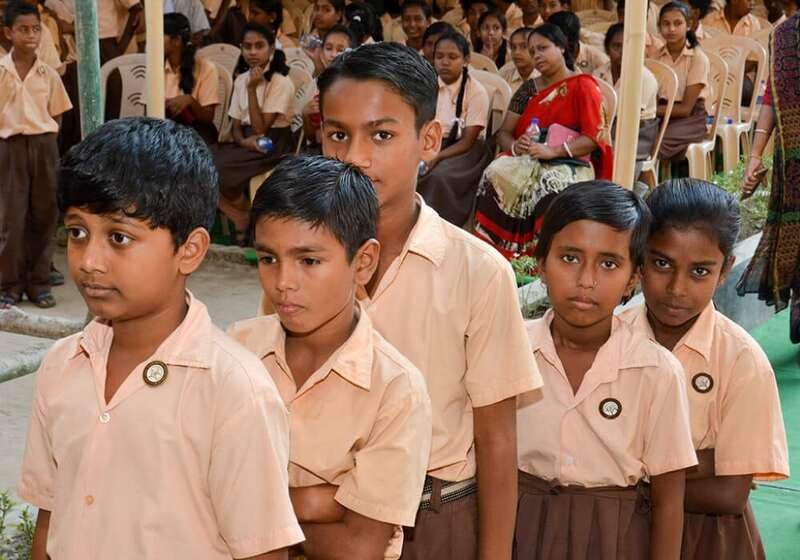 According to the principal of the school, most of the student’s dropout after a certain age either because they have to earn to support their family or they are married off. 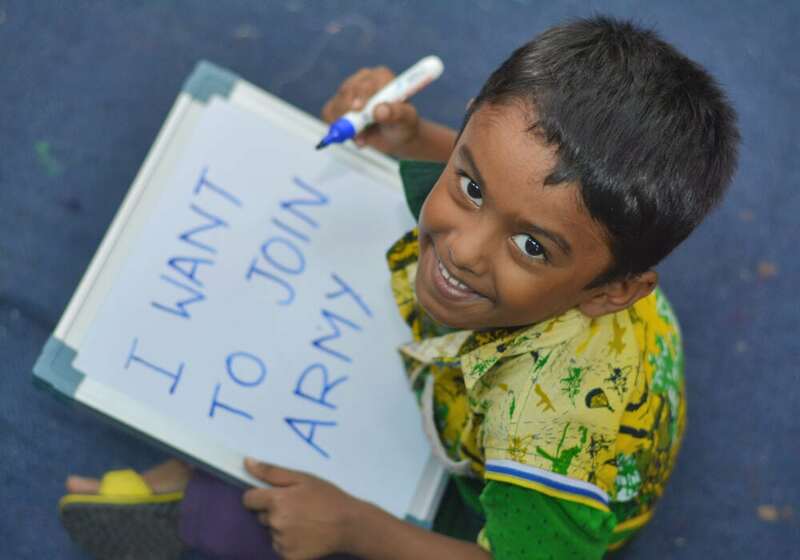 Our initiative received an overwhelming response from students, parents, and teachers of the school. The principal and the head teacher thanked our organization for the small step that we had taken to spread education among the children. They expressed their heartfelt gratitude towards us and said that such noble initiatives must be taken more often in order to increase the literacy rate in the society. 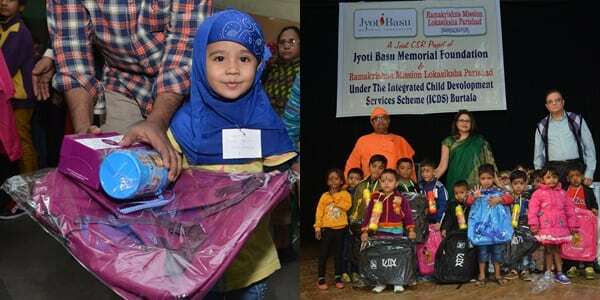 JBMF sticking true to its belief in creating value in the society through smallest of gesture has joined hands with Kolkata Gives Foundation in their “Sirf Ek Kambhal” initiative in order to provide blankets to the less privileged section of the society. 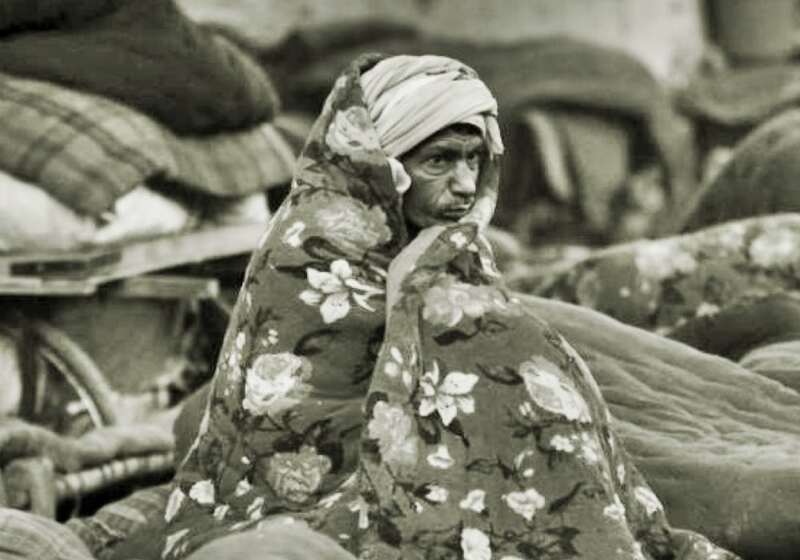 Partnering with “Sirf Ek Kambhal” initiative would help us to reach the most vulnerable people and we hope that this small act on our part can spread warmth and happiness among them, this winter. JBMF organized a free medical check-up event in collaboration with Northern Light Hospital (Gouri Bari Lane) in North Kolkata on 13th December 2017. 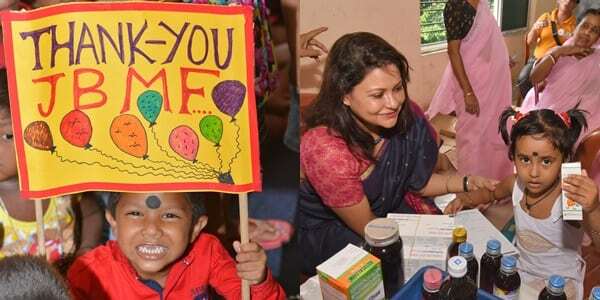 The event started at 10:00 in the morning and continued till 4:00 in the evening.The main goal of the program was to provide free medical check-up and medicines to the less privileged people. 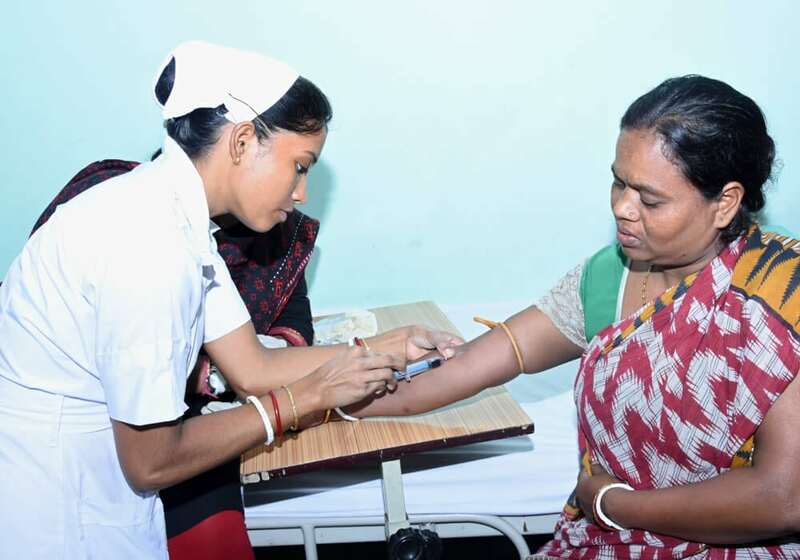 Various medical tests like Hb%/TLC/DC/ESR, Urea/Creatinine, Na+/K+, LFT- SGOT/SGPT, Urine R/E, ECG, Random Sugar/HbA1c and TSH were conducted and the patients were treated accordingly. The area around the hospital is densely populated with people living in vulnerable conditions and hence they cannot afford basic medical treatment. Moreover, they were quite unaware of the importance of maintaining proper health and hygiene which in turn leads to various diseases and nutritional deficiencies. There were patients of all ages and we spoke to them to get a fair understanding about the problems that they are facing in terms of affording medical treatments. Kamala Das, a 60-year-old woman said that she has been facing acute breathing and heart problem for a long time but she is too poor to afford proper medical facilities.She was relieved to get the right treatment.Geeta Ghosh and Reba Das said that they are extremely happy that such an event has been hosted to take care of their medical problems. They also said that such initiatives must be taken more often.The initiative received an overwhelming response from the people. We also spoke to the doctors regarding the various medical problems faced by the less privileged people of our society. According to Dr Mollinath Mukherjee (founding member of Northern Light Hospital), the basic medical treatment is affordable but the main problem lies in the commercialization of medical sector making it impossible for the general public to afford basic treatment.Corporate set up pressure is one of the main reasons why medical facilities have become so expensive. On being asked about his opinion about JBMF and it’s initiative, he said that it is an excellent effort. He further added ,that the hospital and JBMF have the same motto. If multiple people with the same aim work together then we can get a better output. JBMF’s founder, Mrs Rakhi Basu was also present throughout and was closely monitoring the smooth execution of the event. A total of 70 patients were treated that day. 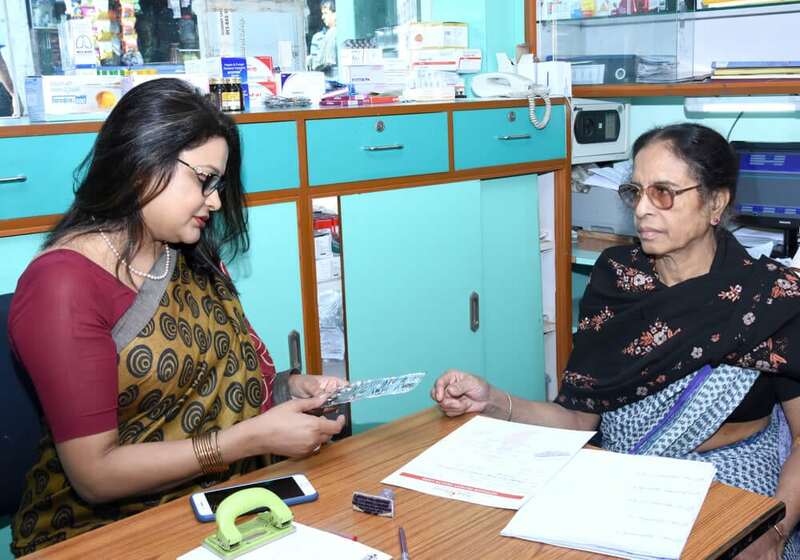 Along with some refreshments like cake, biscuit and tea, the patients were also provided with health cards which can be further used to keep a track of their health history. 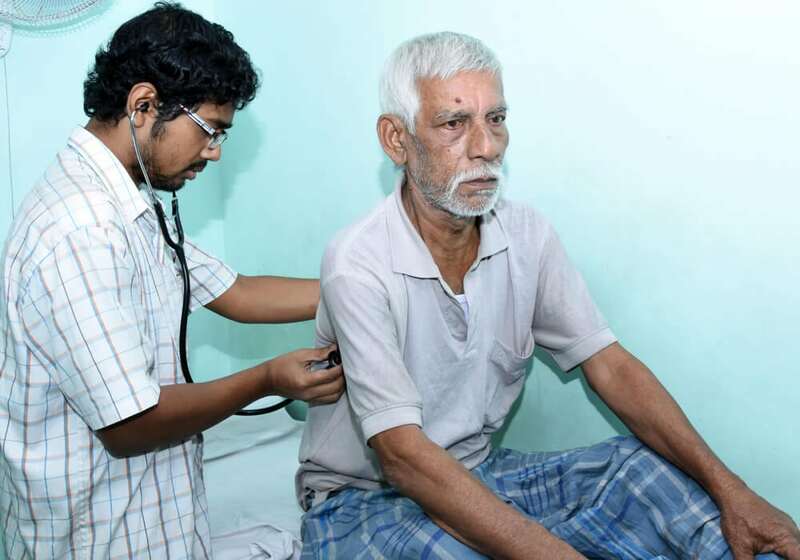 JBMF is also providing follow up treatment to the patients. The event was a complete success and was appreciated by everyone. In fact, the patients, doctors and the hospital authorities said that they are looking forward to more such initiatives on our part. A famous quote says that, “Education is not preparing for life; education is life itself”. According to a report by the United Nations Educational, Scientific and Cultural Organization (UNESCO), India has the highest number of illiterate adults. Illiteracy in India is more or less concerned with different forms of disparities that exist in the country. Income imbalances, gender imbalances, caste imbalances, state imbalances, technological barriers are some of major reasons for such high illiteracy rates in the country. Jyoti Basu Memorial Foundation believes that no child must remain uneducated because he/she cannot afford to buy a book. 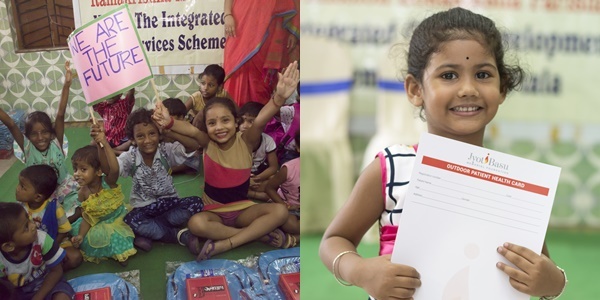 In order to stand true to our belief, we are partnering Ramakrishna Mission’s outstanding initiative named the “Integrated Child Development Services” (ICDS). Under this program, we plan to start with distributing study materials to more than 100 anganwadi schools in order to spread literacy among the masses. The joint events with Ramakrishna Mission for the month of December (2017) and January (2018) were a huge success. 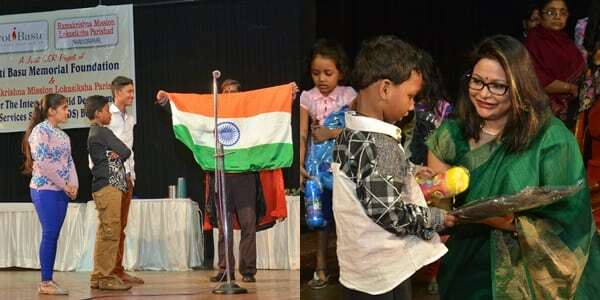 The auditorium was fully packed with smiling faces of children who were eagerly waiting for their turns to come so that they could receive their study materials. New school bags, bottles, books, copies, colour pencils, chalk boxes, whiteboards, pencils, erasers etc were distributed to the students by Swami Stavapriyananda Maharaj (Joint Director, Ramakrishna Mission Lokasiksha Parishad), Mrs Rakhi Basu and Mr Chandan Basu (Trustees, Jyoti Basu Memorial Foundation).The enthusiastic team members of Jyoti Basu Memorial Foundation made sure that the event ran smoothly. 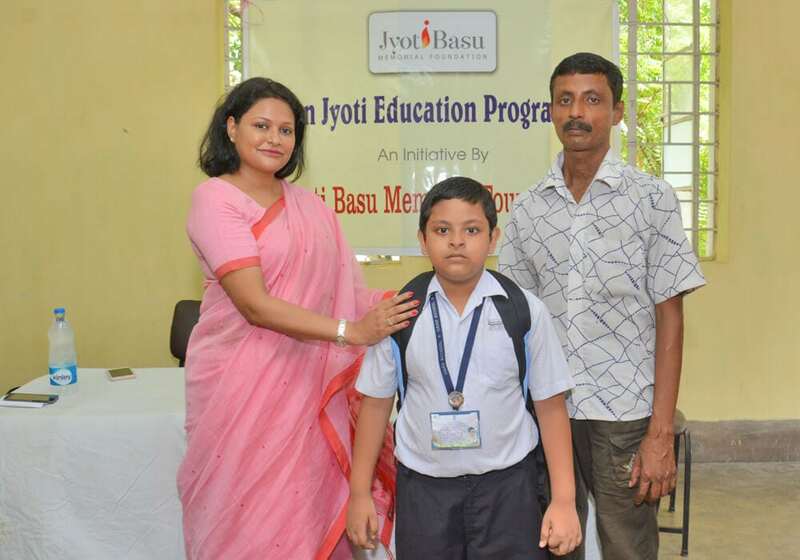 We received an overwhelming response from teachers, parents and students and everyone was looking forward to more such activities initiated by Jyoti Basu Memorial Foundation in the near future. Regardless of gender, education is a necessity for all as they contribute towards making the society a healthier place to live in. Getting the basic means of education is the fundamental right of every human being. 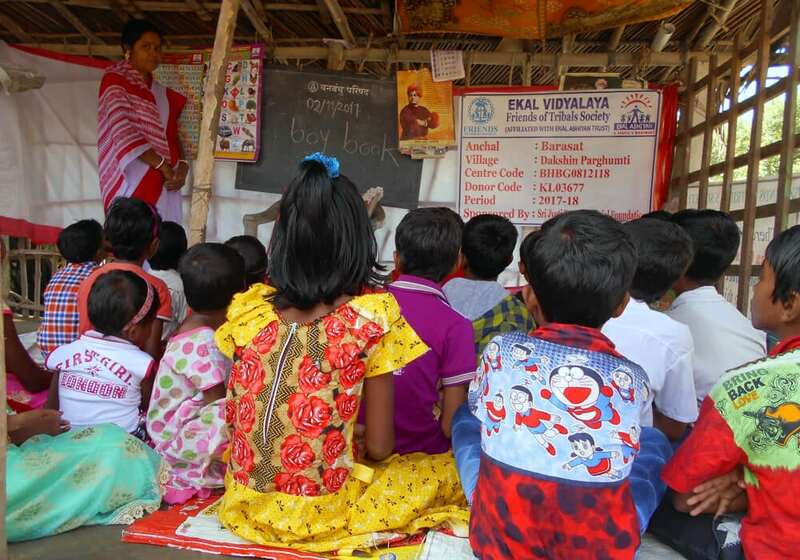 Education empowers the human mind and helps the society fight against all kinds of social ills like caste discrimination, gender inequality, child labour, child trafficking and other numerous issues related to the violation of human rights. All the above mentioned social problems are causing hindrance to the development of our country. These issues can be overcome only by spreading education among the masses. We, at Jyoti Basu Memorial Foundation believe that the children of today are the citizens of tomorrow and therefore they must be educated enough to cater to the progress of our country. It is for this reason that we have collaborated with Ramakrishna Mission and are supporting their ICDS (Integrated Child Development Sevices) Project. 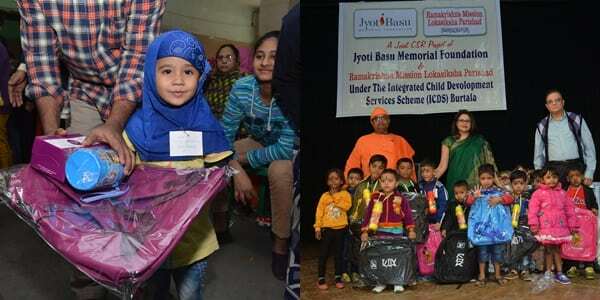 Jyoti Basu Memorial Foundation along with Ramakrishna Mission hosted its third (February 2018) and fourth event (March 2018). Mrs Rakhi Basu (Trustee of Jyoti Basu Memorial Foundation), Swami Stavapriyananda Maharaj (Joint Director, Ramakrishna Mission Lokasiksha Parishad) and the team members of JBMF interacted with the children and distributed story books, theme books,copies,magnets,magnifying glasses, crayons and other essential study materials among them. In both the events, we took a special step for the encouragement and upliftment of the education of the girl child, which is lacking in many underdeveloped and developing countries. We really hope that this small yet humble initiative on our part helps our nation grow more in the coming years. 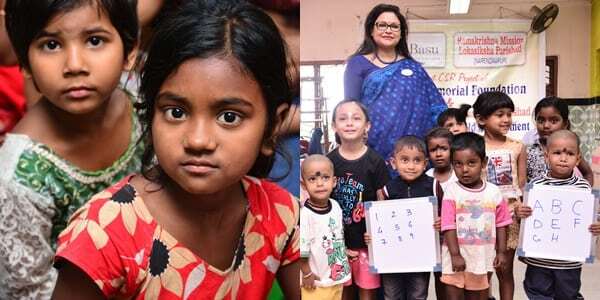 Staying true to our belief that education is pivotal for the growth of the child, we at Jyoti Basu Memorial Foundation have again come together with Ramakrishna Mission to host the event for the month of April. One of the main aims of the ICDS (Integrated Child Development Sevices) programme was to make the lesser privileged aware about the importance of education. Along with the regular study materials that we provide to the children every month, we also distributed colourful story books, clocks, puzzles, educational charts and weighing scales to the teachers so as to ensure an interactive and creative study session. The JBMF team interacted with the kids and gratefully could also spend quality time with them. We heartily appreciate the support and cooperation of the parents and the teachers. The kids also got an opportunity to mingle with each other and play joyfully with their new toys. The carefree smiles on the faces of the children made the event a grand success. We believe that a country cannot progress if the majority of its population is uneducated. 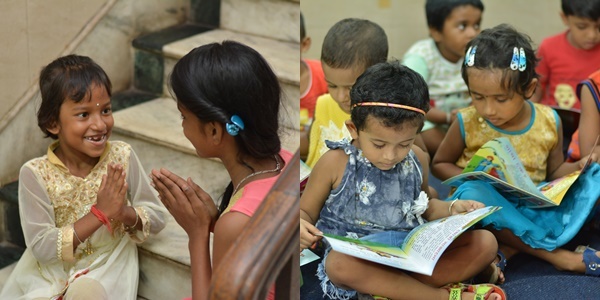 It is for this reason that we have joined hands with Ramakrishna Mission and are partnering its noble initiative named the ICDS (Integrated Child Development Sevices) Project. As of now we have distributed essential study materials and toys to about 1000 children of a particular area. We hope that our continued support will help in making the lives of these children in accessing equal opportunities in life. 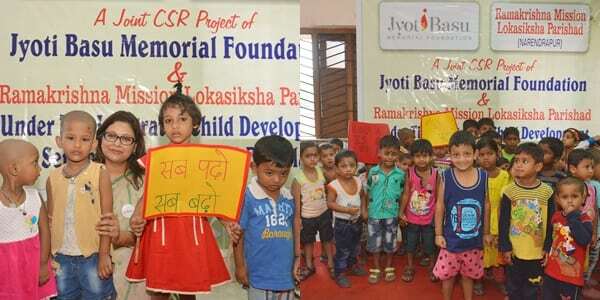 Jyoti Basu Memorial Foundation in the month of May 2018 hosted an event together with Ramakrishna Mission under the “Integrated Child Development Services” (ICDS) which was a huge success. 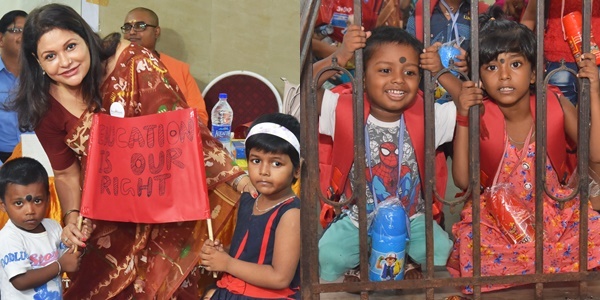 On this day, Mrs. Rakhi Basu and Swami Stavapriyananda Maharaj along with the teachers and the other team members got an opportunity to spend some quality time with the children. It was an overwhelming moment for all of us when we witnessed the gleeful faces of the children and their mentors when they received the regular study materials that we distribute every month. India has the world’s highest demographics of children suffering from malnutrition. Children receiving balanced meals reportedly have increased attention span and energy levels which is reflected in their academics and extracurricular activities. Our main objective is not only to provide education to the underprivileged children but also to ensure awareness about the importance of a proper nutritious meal among them. It is for this reason that we provide a healthy breakfast to children in all our events. The event of May 2018 was hosted in a distinct way. 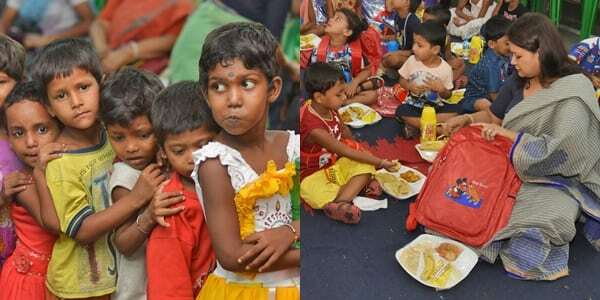 We provided lunch to the children after the event and were fortunate enough to catch a glimpse of the happy smiling faces of the children opening the food packets with glee. They were so euphoric that they didn’t even take any kind of assistance from their teachers or parents while eating. 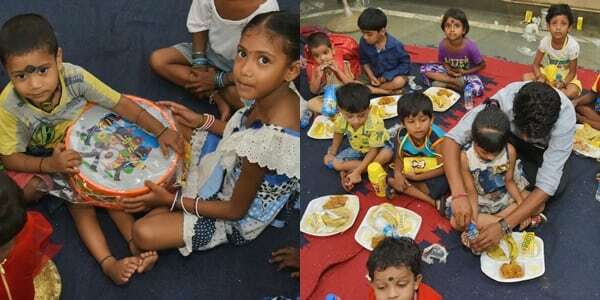 The kids relished the food so much that there were no leftovers. We realized that for a child belonging to the underprivileged necessitous section of the society, a single meal is the best source of happiness. India consists of almost 13.1 percent of child population aged 0-6 years. Today’s children are the future of the nation and therefore it is necessary that our country comprises of healthy children. Poverty and illiteracy are two major reasons why 43 percent of children in India are underweight. It is true that malnutrition among the children has been reduced significantly over time; there is still a large percentage of children that remain malnourished and as result suffer from numerous health issues from a very early age. 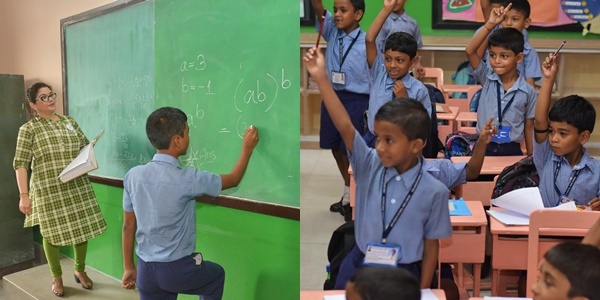 We at Jyoti Basu Memorial Foundation believe that only a healthy child can excel in academics. Therefore, staying committed to our belief; we have organized a medical camp in collaboration with Ramakrishna Mission for children below 6 years on the 19th of June, 2018. 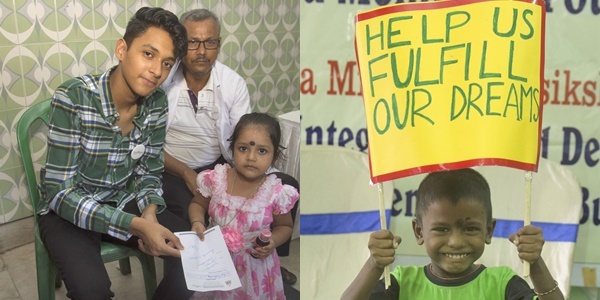 Out of 200 children present at the medical camp majority of them belonged to one of the economically weaker areas of Kolkata (Ultadanga, Telenga Bagan). These children come from the vulnerable section of our society and don’t have access to even the most basic medical services. 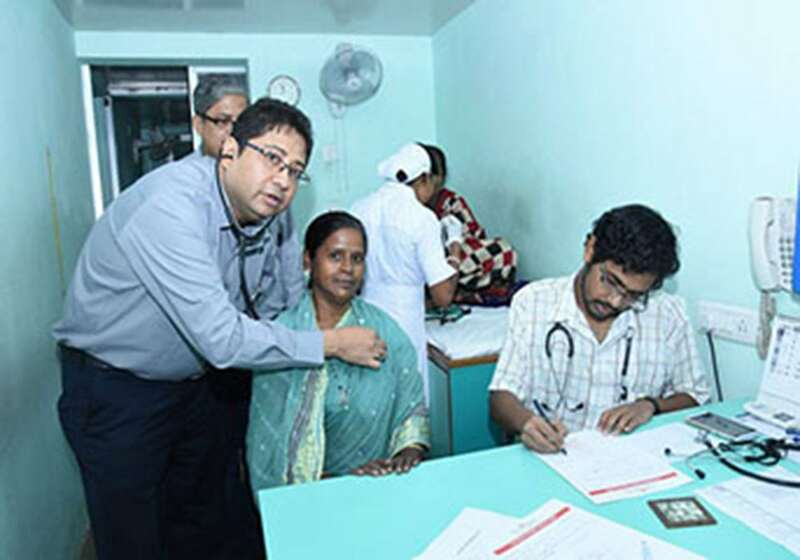 Dr Surendra Nath Banerjee along with his medical team conducted a general check-up of the children. The medical team also spoke to the parents of each child to get a clear idea about the health of the child. According to the data provided by World Bank, India has the world’s highest demographics of children suffering from malnutrition. The weight of every child was also checked before providing them with medicines. 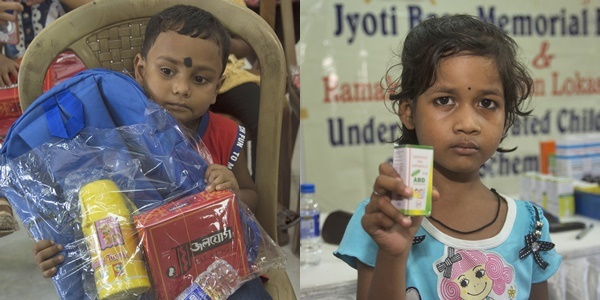 JBMF volunteers along with the nursing staff distributed free medicines along with the prescription among the children and also interacted with the parents on the importance of maintaining proper health and hygiene among children. The enthusiastic teachers played a vital role towards the success of the event. 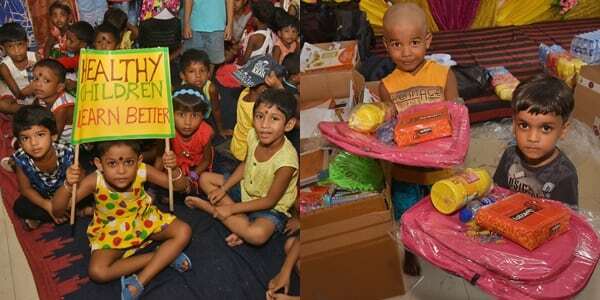 After the medical check-up of children, the regular study materials like story books, colourful educational toys, picture charts, puzzles, crayons and many more study items were distributed among them which they received with much joy and happiness. 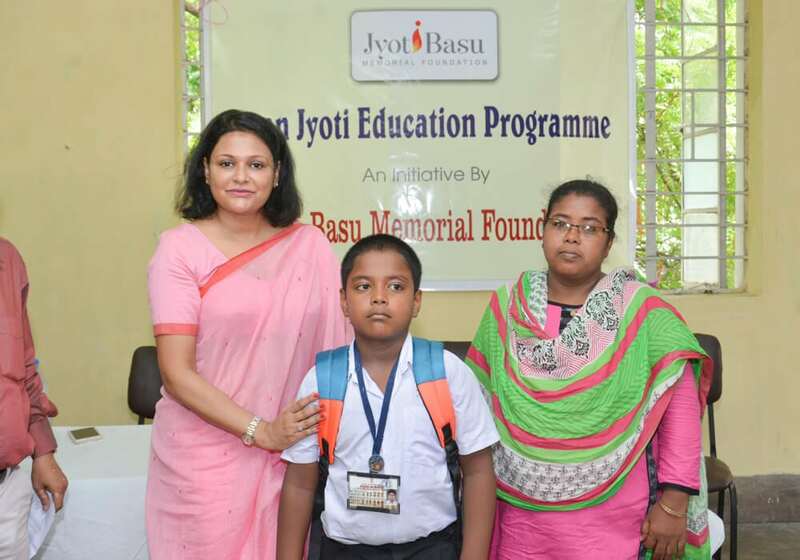 Jyoti Basu Memorial Foundation has joined hands with Don Bosco (Park Circus) and has associated with their night school teaching program. Under this initiative we are sponsoring the night school teaching staff. Their night school has approximately 400 students and they provide education to boys till class 8. Recently the JBMF team visited the night school classes and had an interactive session with the students and teachers of the school. The students were very eager to meet our volunteers who spoke with them about their favourite subjects and also asked them what they wanted to become when they grow up. Our team tried to make the interactive session interesting by sharing their own student life experiences with the boys and also told them that they need to study hard and do well in their tests in order to achieve their dreams in life. The boys of the night school belong to the vulnerable section of the society and our main goal is to make them self sufficient so that they can atleast enjoy the basic necessities of life. Our volunteers also helped the children revise grammar and maths orally. The motto of Jyoti Basu Memorial Foundation is to make the society a better place for the future generation. This collaboration has enabled us at JBMF, to stay true to our belief that education is the most powerful tool to constructively empower one’s life. When we talk about gender equality it means having equal access and opportunities regardless of gender. India is a country with the lowest female literacy rate in Asia. The low literacy rate among the girls of India is the root cause of many problems like dowry deaths, child marriages, sexual harassments and ill health conditions. It is one of the main reasons for unequal stature of men and women in our country. The theme of our 8th event in collaboration with Ramakrishna Mission was gender equality. Children from very needy backgrounds were present at the event and were accompanied by their parents and teachers to the venue. The event started with the distribution of the regular study materials and food packets among the children. The major problem when it comes to education of girls is the backward thought process of the people. In order to bring about a change in this mindset, we must target our audiences from the grassroot level. Even today in the 21st century, there are many people who question the education of girls. The JBMF team interacted with the parents at the venue and spoke with them regarding the importance of educating a girl child. Our volunteers put their heart to explain them how a nation’s progress is dependent on education of girls and how it can lead to gender equality. We are perennially grateful to the teachers for helping us transmit the core message of female education and supporting us in carrying out the event smoothly. Due to lack of educational materials, the school conducts very limited extracurricular activities. Therefore, we distributed colour pencils, picture charts, plasticin, puzzles, dolls, drums, balls, string instruments, xylophones and rattles among the ten schools present so that they can conduct extracurricular activities as well. Still today, many people think that a girl child is born to look after the household chores and she is meant to be in the kitchen. This is one of the major reasons for the high dropout rates in females. JBMF is relentlessly working to change this notion through its activities so that gender equality can be achieved. Jyoti Basu Memorial Foundation has joined hands with Ramakrishna Mission and has been trying to make quality education accessible to all. Under this program, we are distributing study materials to nearly 100 + anganwadis (schools) every month. The joint event for the month of August was hosted on 11th August, 2018 and the venue was fully packed with smiling students, enthusiastic teachers, parents and earnest JBMF volunteers. The event started with the usual distribution of study materials that we give every month to the students. Our volunteers also spoke to the parents about the importance of education in bringing about a positive development in our country. 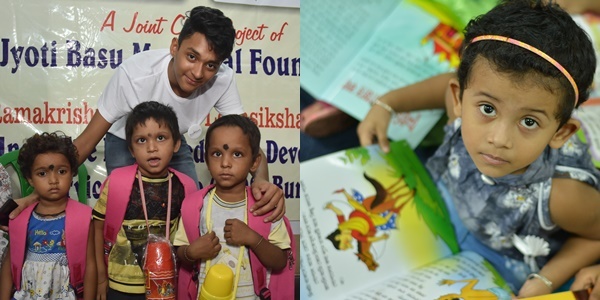 Jyoti Basu Memorial Foundation’s major goal is not just limited to spread literacy but also to ensure proper healthcare facilities to the children. The doctor along with their assistants conducted a full medical check-up of the children and provided them with medical advice. As a part of our efforts to make basic healthcare accessible for all, we made available the required medicines as prescribed by the doctors. The medical camp was set up with the sole aim to bring awareness amongst the deprived population of the country who have no access to basic health care services or knowledge about the diseases they are suffering from. Jyoti Basu Memorial Foundation looks forward to organize more such events in the near future. Kerala was striked with one of the worst floods in the month of August,2018 .As we all are aware that the flood had devastating effects on the residents of the state, villages got washed away, houses broke down, people died and some went missing too. The Indian government has declared the flood as level 3 calamity. Rescue operations and relief camps were being set up all over the country to help the disaster affected people. As Kerala has been fighting this battle, NGO’s, private firms, celebrities, ministers and common people have extended their utmost support in every possible way to help the inhabitants of the flood affected state. 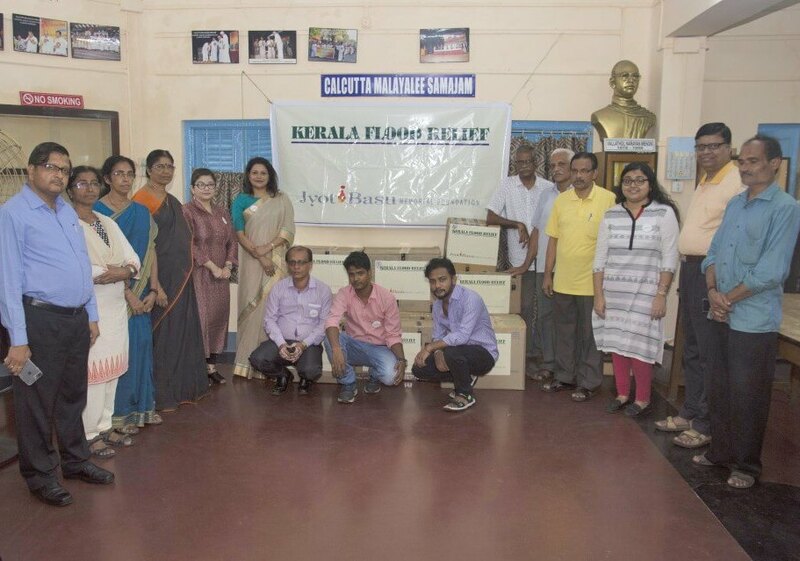 Jyoti Basu Memorial Foundation collaborated with the Calcutta Malayalee Samajam in order to help the people and families living in the relief camps. 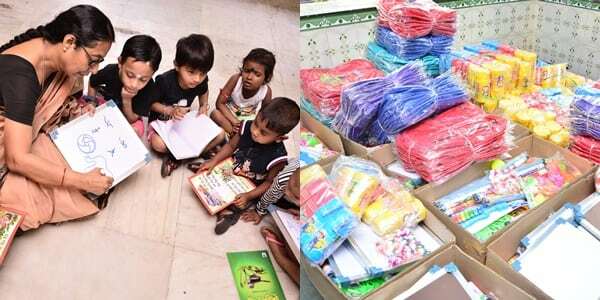 As these people are in dire need of clothes, we sent cartons of clothes like tshirts,sarees,shirts,salwar suits, clothes for children,dresses, kurtis, skirts, tops,capris and many other such items. In the deadliest floods so far in the last 100 years in Kerala, a large number of people are in relief camps while thousands are still stranded in their homes without any food or clothes. We really hope that in such a situation, our humble contribution helps them in every small way possible. Illiteracy and gender inequality still continue to haunt every nook and corner of India. More than 50% of our female population is still uneducated. The low literacy rate among the women of India is the root cause of many severe socio-economic problems like dowry deaths, child marriages, sexual harassments and ill health conditions. It continues to be a major barrier in the upliftment of the status of the women in the society. 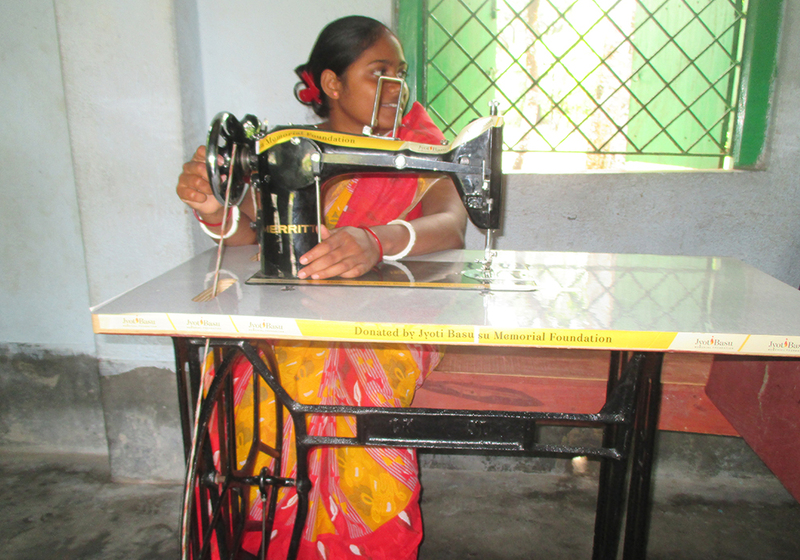 We at Jyoti Basu Memorial Foundation believe that it is very important for women to be self-sufficient and independent so that they can take charge of their own lives. Staying true to our motto, we have joined hands with Ramakrishna Mission in order to support the women of Arampur village. The houses of the people living in the Arampur village were completely destroyed when cyclone “Aila” hit the region in 2009. Unfortunately; the effect of the natural disaster was so severe and deep-rooted that even today the inhabitants of the region are striving to lead a normal life. The people of this area are extremely poverty stricken and are deprived of even the most basic necessities of life. We distributed sewing machines to the women living in this area so that they can attend tailoring classes, develop their sewing skills and also learn about the basic business practices. 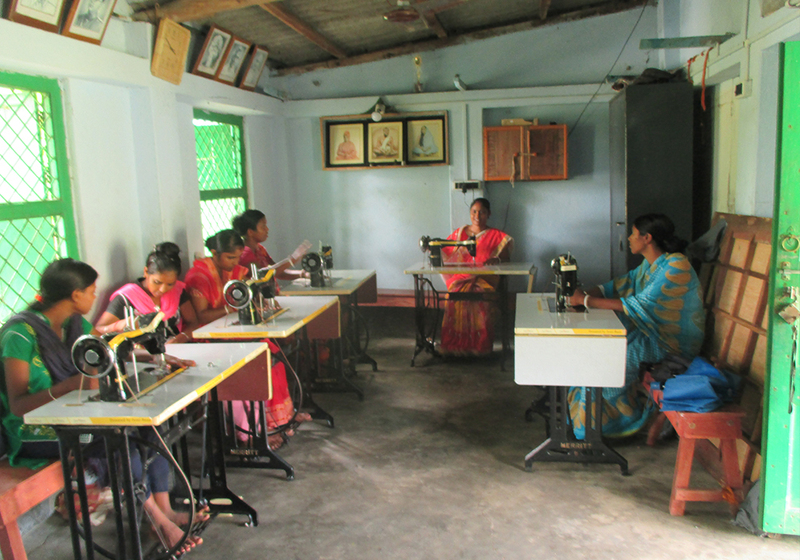 Acquiring sewing skills will not only make these women self-sufficient but will also help them rise out of poverty. We really hope that this small step on our behalf will enable these women to start their own tailoring business and earn a daily income that will provide food and basic necessities to their families. Christmas is a time of celebration, hope, and laughter. One of the best moments for children all over the world is when they wake up on Christmas day, run to their living rooms, and rip open their tightly wrapped presents that Santa dropped off the night before. But as you think of this, we urge you to picture another moment; millions of children around the world, who Santa cannot visit, the kids who he barely misses. Not because they have been naughty but because they were never blessed with the privilege of being able to celebrate this joyous occasion. We, at JBMF, are thrilled to announce our very first, very own Christmas Carnival. 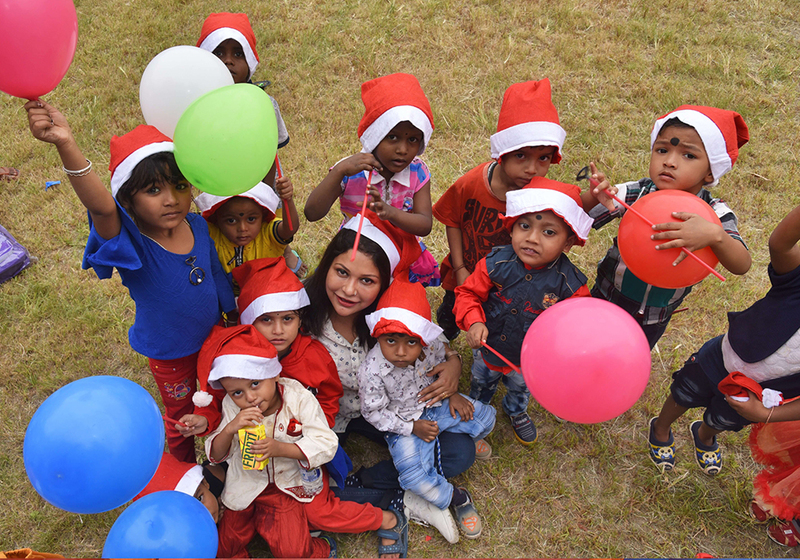 Close to 300 children from poorer, less fortunate backgrounds were exposed to an environment full of fun, games, friendships, and immense amusement. Our hardworking volunteers invested their love, time and energy in monitoring these children and making sure that they have a thrilling time. 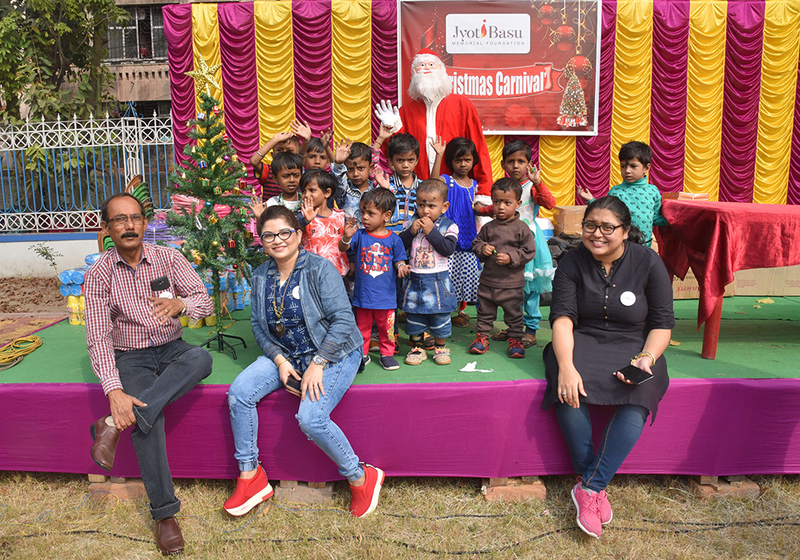 JBMF hosted the Christmas Carnival on 11th December 2018 in Nivedita Udyan Park near Bagbazar. 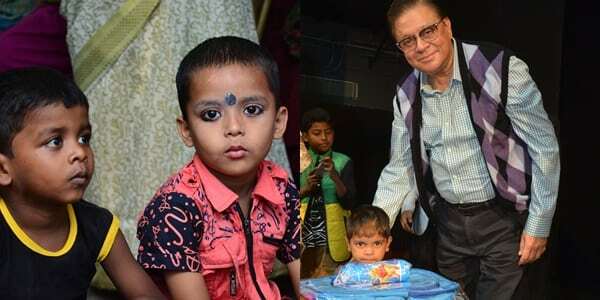 The children came from the Bagbazar area and its surrounding slums (in and around north Kolkata) and were between the ages of approximately 3 to 6 years. 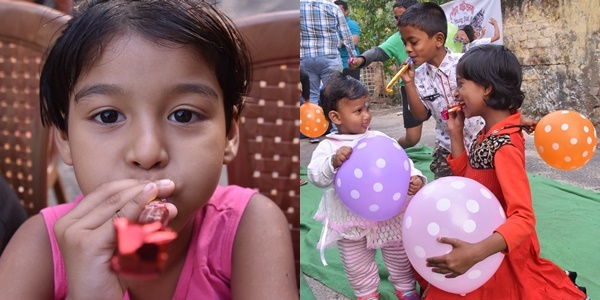 They had the opportunity to eat delicious food, participate in carnival rides such as bouncy castles and merry go rounds, they were also able to play with balloons and streamers, and toys. After that, they spent time with Santa Claus who presented them with many gifts such as caps, whistles, candies, and other toys. But that wasn’t the end of this wonderful day. We also distributed the regular study materials such as books, bags, stationeries, water bottles, etc. On this day, these children were enjoying living in the moments of the carnival. Putting aside their less fortunate lives, they immersed themselves into an environment of immense excitement, uninhibited joy, and uproarious laughter. These children are less privileged than us, so let us, together, give them the memories that they will cherish for a lifetime. We hope that this Christmas celebration by JBMF sets the tone for the approaching new year, a year that promises to be full of unity, self-reliance, and cheerful faces. Spread Joy Through Toy (Event 1). 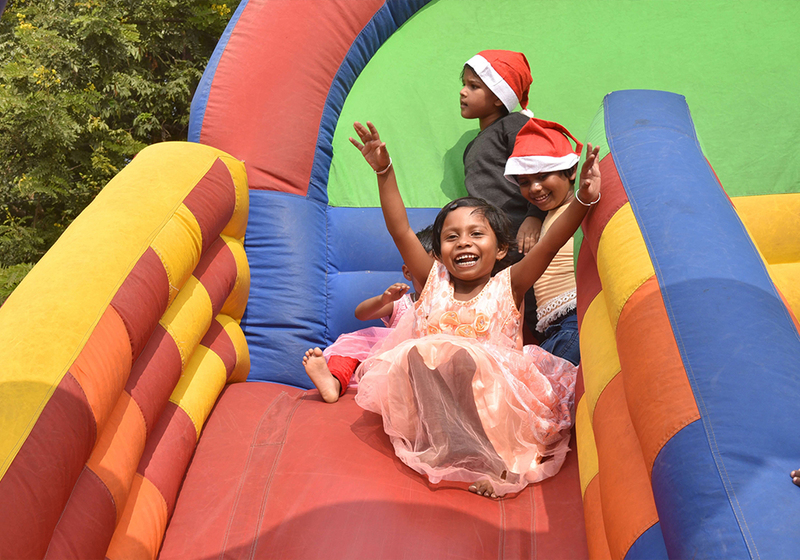 On the 22nd of December, we hosted our second JMBF Christmas Carnival. 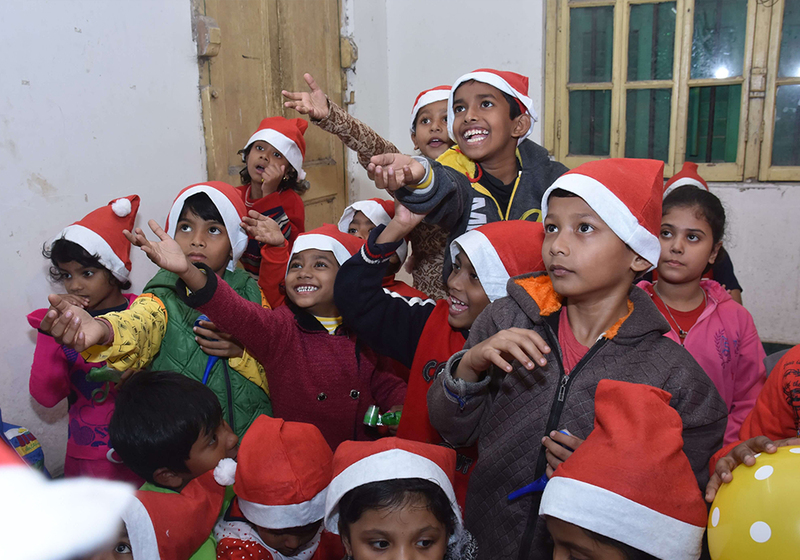 This time we decided to make Santa’s job a little easier by distributing about 400 donated toys to the children. These little souls came from the slums of and around the Keyatala Area. There were about 180 of them and the hall was packed to the brim with hyper, laughing, screaming children. Recently, our efforts and contributions at JMBF have begun to be noticed by the people around us, as well as our followers on social media. Specifically our “Spread Joy through Toy” Initiative. At the start of December, we put up a post and distributed flyers in order to be able to deliver happiness and hope and a fulfilling Christmas to the less fortunate children of society. We requested for donations of toys from anyone that could give so that we may be able to give those to the children we host at our Carnival. We were lucky and our work had been noticed by many so we were blessed with over 400 toys by many Secret Santas such as Don Bosco School and many of our followers on social media. The good people of Keyatala Netaji Sangha helped us host our event in their hall where we held a jam-packed party with about 180 special little guests and about 7 to 8 volunteers. First, we gave the children each a whistle to blow to their heart’s content and make all the noise that they cannot otherwise. 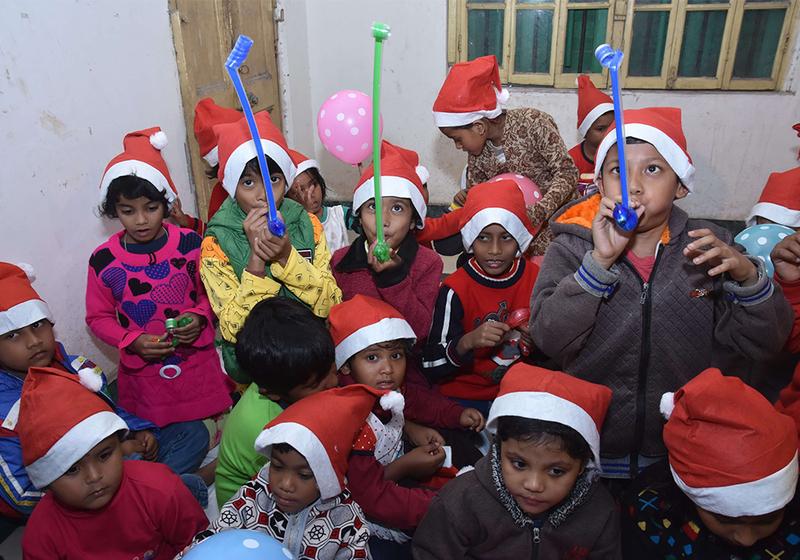 The kids were overjoyed and really did do justice to the whistles as they blew and screamed at their full potential and created a piercing sound. A sound of hope and happiness. Then, we gave the children candy, which they ate all they could. Finally, we distributed the toys to the kids. Every single child knew what they wanted and they got it. The ones who wish to be Spidermen and Supermen took the action figures. The young scholars took storybooks and puzzles. The aspiring police officers and firemen took the cars and firetrucks. And the young doctors made sure to take the doctor sets to set themselves up for the future. For this event, we would like to thank every single person and institution who helped us bring it to life by donating to our cause and making this Christmas one for the kids. This type of example is why we do what we do. And we could not have asked for a better way for the kids to end their year. We wish everyone a very happy JMBF New Year. Onto bigger things! Spread Joy Through Toy (Event 2). Our childhood days are the most cherished phase of our life. As adults the nostalgic moments often brings a gleeful smile on our face while fighting with the mundane routine of life. So it is necessary for all of us to have a happy and healthy childhood which can be a source of joy even in the most difficult stages of our adulthood. Unfortunately, some children are not lucky enough to enjoy a normal childhood and their innocence is lost in fighting the day to day hurdles of poverty. JBMF organized its recent event in association with the “Penchabortola Young Star Club”. The venue was beautifully decorated with colourful balloons and streamers. 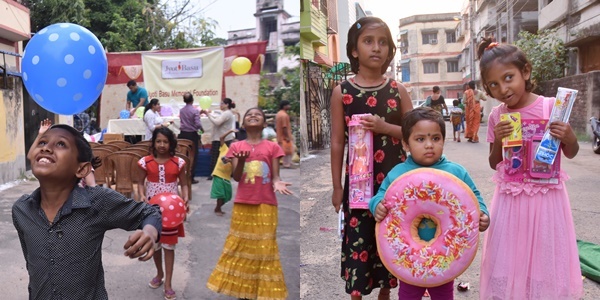 We distributed different kinds of toys, colourful balloons, delicious candies, crayons, whistles and other stationeries to more than 100 kids living in and around the slum areas of Penchabortola. No sooner did the JBMF volunteers give away the balloons and whistles to the children did they start screaming with joy, laughter and excitement. For a moment it seemed that they have never been happier. With sparkling faces, the kids waited to pick and choose more toys from us. This was one of those rare occasions when they got to choose the toys they always wished to have but otherwise couldn’t due to their unfavorable backgrounds. The little girls chose doll houses, kitchen sets, barbie dolls, soft toys, teddy bears while the little boys went for bats, hockey sets, balls, bowling sets, remote controlled cars, and cartoon figures like superman and batman. The parents were extremely happy too. 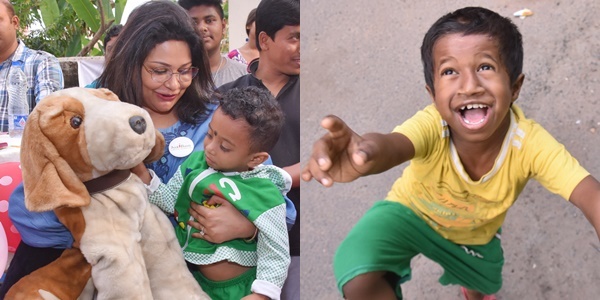 It doesn’t take much time to bring a smile on the faces of these children and we are trying everyday to be the silver lining in the lives of these underprivileged children.